Innovation in Public Health from Dr. Devlin. Brunswick County Health Director Don Yousey and Dean Smith, retired long-time basketball coach at University of North Carolina at Chapel Hill, have each been awarded the 2009 Ronald H. Levine Legacy Award for Public Health in recognition of their outstanding contributions to public health in North Carolina. The awards were announced by State Health Director Leah Devlin at the 2009 State Health Directors Conference in Raleigh on Jan. 24. Named for former North Carolina State Health Director Dr. Ron Levine, the annual award honors individuals whose life work on behalf of the public’s health has resulted in significant, sustainable and positive improvements in North Carolina’s public health system. 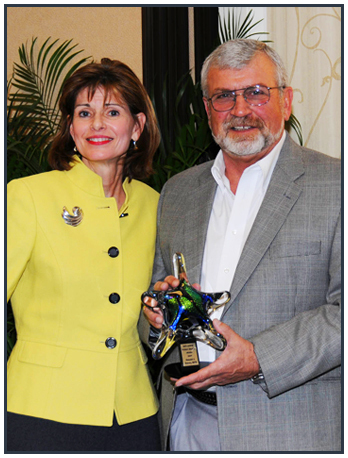 The 2009 Levine Award for Local Innovation in Public Health was presented to Don Yousey, who has been health director of Brunswick County for more than 10 years. Yousey was honored for a long list of accomplishments, including securing grant money for a new outreach medical unit, establishing a regional office to administer case management services for Medicaid clients, and starting a clinic for seniors with no medical home. Yousey also led a focused effort by the health department and Minority Infant Mortality Task Force that resulted in two consecutive years of a zero infant mortality rate in the county. Among his many other successful projects was the establishment of an umbrella organization to enable area local health departments to provide low-cost diabetes self-management education that is reimbursable by Medicaid, Medicare, and private health insurance. The pilot project was one of five in the state to get American Diabetes Association approval in 2008. A native of Rome, N.Y., Yousey received his master’s degree in Public Health from the University of Texas at Houston in 1984. He retired to North Carolina from the U.S. Air Force as a lieutenant colonel in 1993. He served as health director of Bladen County for almost four years before transferring to Brunswick County. Yousey is past president of the North Carolina Association of Local Health Directors and was the recipient of the 2003 Health Director of the Year Award and the 2005 Ham Stevens Award. The Levine Award for Statewide Impact in Public Health went to Dean Smith. Dean Smith spent 39 years of his life coaching at UNC – the first three years as an assistant and the final 36 as the head coach. At the time he retired, he was the winning-est and most respected coach in the history of Division I collegiate basketball. Recognized as one of the great minds of the game, Smith is widely known and respected for his intelligence, his innovation, and his love for his players. At the conclusion of the award ceremony, Dr. Ron Levine made a surprise presentation of a 2009 Legacy Award for Public Health to Dr. Devlin herself. Devlin is retiring on Jan. 31 after 30 years in public health, serving on local, state and national levels. She has been State Health Director and director of the N.C. Division of Public Health since 2001.